The Northern Virginia area’s screen room contractor of choice is Fairfax Contractor. We are experts in taking your dreams of a new screen room and turning them into reality. We work our design team to create the most innovative designs in Northern Virginia. We can create the perfect screen room for your home. To build a screen room in Northern Virginia the first step is to come up with a wish list of what you want in the way of a design, materials, budget and size. Once these decisions have been made we can help you design an affordable custom screen room project for your home. When you’re wish list has been determined, we will utilize licensed Virginia state civil engineers to engineer plans for your screen room to be used for permit acquisition. Fairfax contractor will secure all necessary building permits and electrical permits to build a legal code compliant screen room. In designing your screen room project there are many options that you may want to include into the overall project. Probably one of the most common options is to include a patio under the screen room deck, or a patio that projects outward from the screen room. Having a patio that is next to your screen room, brings out the best of both elements in outdoor entertaining. A screen room is great protection against bugs and rain, and the patio is perfect place for fair nights and creates a great gathering place. 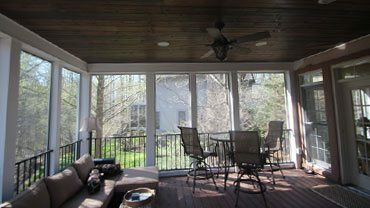 Fairfax Contractor excels in creating both screen room and patio outdoor living spaces. An electrical plan should be included in your screen room, it is always wise to plan for additional outlets, lighting, and perhaps a ceiling fan. By far one of the most sought after options for screen rooms is to have a tongue and groove ceiling installed in the interior of the screen room . The tongue and groove ceiling to be installed in the interior of the screen rooms offers a beautiful finished look. If you decide to have a tongue and groove ceiling installed in your screen room, there are options including different species of woods, tongue and groove style, painted, or stained finish and others. Many northern Virginia homeowners also like to include flat screen televisions, and sound systems in their screen room design. We are experts in coming up with the perfect installation of speakers and outdoor style flat screen televisions in your screen room installation. Many simple screen rooms may not utilize PVC rap on exposed pressure-treated lumber, but we highly recommend this to give your screen room a custom look. We can trim it out with material such as AZEK. Utilizing fiberglass columns to encase the support beams of your screen rooms will definitely help in defining this addition as a premium project. We believe once you have planed your screen rooms you need to start refining the material that is to be used to construct your addition. Perhaps the most important consideration in designing you screen room project is a type of decking you will utilize for the floor. Fairfax Contractor’s primary choice is composite deck boards. Utilizing composite decking has many benefits, such as low maintenance, and a prefinished material that will take your screen rooms project to the next level. Beyond decking, one should consider decorative interior and exterior trim to make your screen rooms standout. We utilize materials such as Azek which is a maintenance-free, PVC trim board that can finish out the exterior and interior of your screen room. Some of our clients request tongue and groove ceiling material to finish off the project. Using a pine tongue and groove ceiling is fine if you want it painted, but if you want to stain your screen room ceiling perhaps you should consider utilizing a wood such as birch. Fairfax Contractor can recommend excellent composite railing, and screen material that will stand the test of time. Our planning staff can recommend materials that are on the cutting edge of the latest designs, and will create the perfect screen room.